Within three days from the 2nd to the 5th of October about 200 participants of various member companies had the opportunity to get to know new members and to maintain existing contacts. Yearly, companies from around the globe meet each other and talk about services and possibilities of cooperation. The Interfracht group was represented this year with colleagues from four subsidiaries (Germany, Sweden, The Netherlands and Romania). 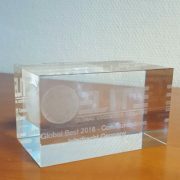 This year Interfracht Germany received the award „Global Best 2016 Communication“. We are glad and recognize this award as an appreciation of our work.